It’s at the most random moments in life that sometimes you’re lucky enough to get some ray of sunshine amidst the (you know where this is going, it’s cliche but true!) cloudiness of a day/month/year. School has been particularly merciless as of late and having finished tons of homework I needed to take photographs of street art for a piece I was writing. I took the photographs and then found myself without gas and late to dinner with a friend. Okay, so my cloudiness wasn’t that big of a deal. But grumpily I was leaving the gas station and had to make a detour in lieu of an illegal left turn (I learned the hard way how expensive these are) and felt my jaw drop open when I came upon two entire walls FULL of street art. I overheard a woman talking to a couple of men about the art as I snapped pictures. I chatted with her for a bit and found that the store is still open (it was closed on the day I saw it and I thought maybe it was the case of an abandoned building being used for street art) and that the artists talk to the owner before putting their work up. She told me how the pieces do change when the artists feel the need to change them and that one of her friend’s sons had actually wanted to put something up. “Do you like to paint?” she asked me and I shook my head laughing and said no, I just appreciate street art. And boy was there a LOT to appreciate. Obviously, these artists are talented already but when street artists actually get permission from store owners, instead of creating illegal pieces in a hurry, a lot more time and thought can go into the pieces. The walls were divided into a pretty significant amount of wall space for each artist. The first piece was a humorous, Christmas-themed work. 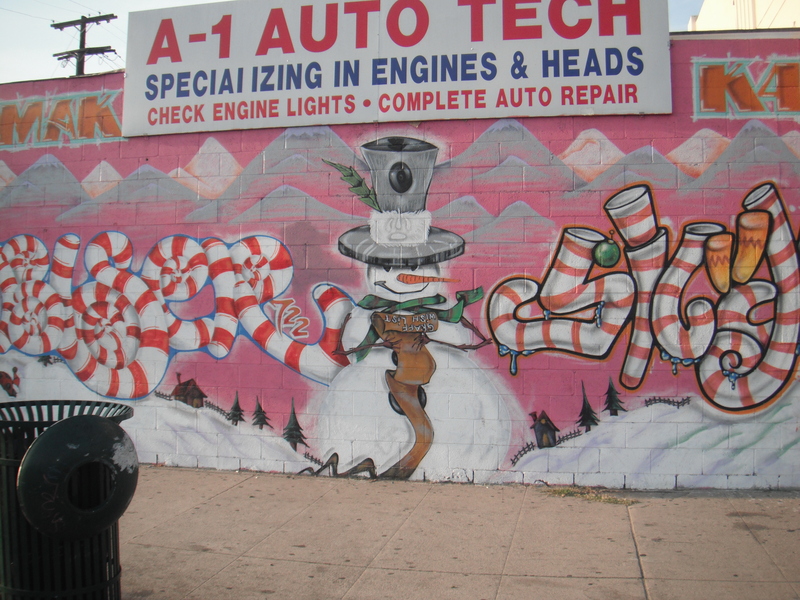 If you look closer, you can see that the list the snowman is holding says “graff wish list,” a list of things the graffiti artists want. Of course, no artists would want to create their work on the street without getting their due, so they leave their “tag,” or street art nickname on the piece. 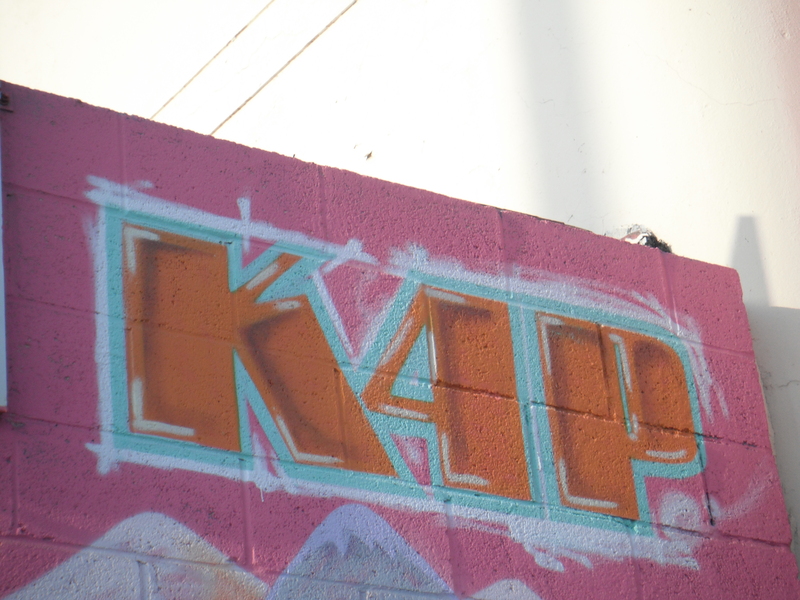 I Googled K4P and found out that MAK and K4P actually go together —- they stand for Modern Art Kings and Kill 4 Pride. 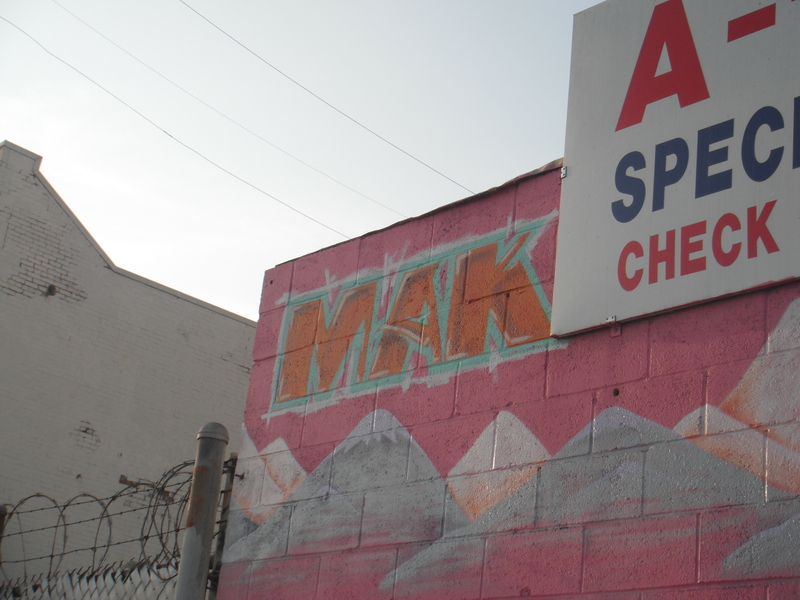 The names might sound like gangs names, but it’s common for graffiti artists to band together in groups for the sake of creating art together, and MAK K4P make sure to emphasize that they are not a gang, but as their YouTube channel says “a group of eclectic artist(s) who are passionate and prideful of who we are.” You can check out their video here. 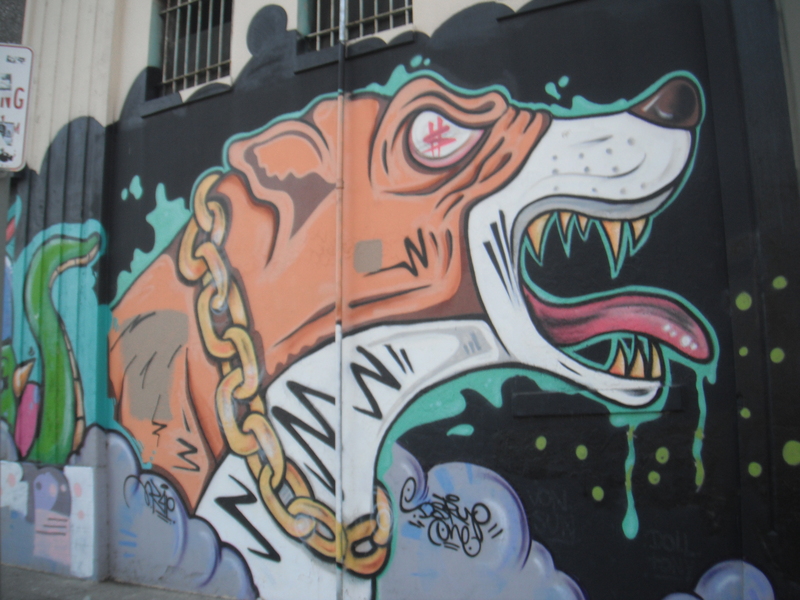 Graffiti artists are creative not only in the way they plan things like color but also in the creatures they create. 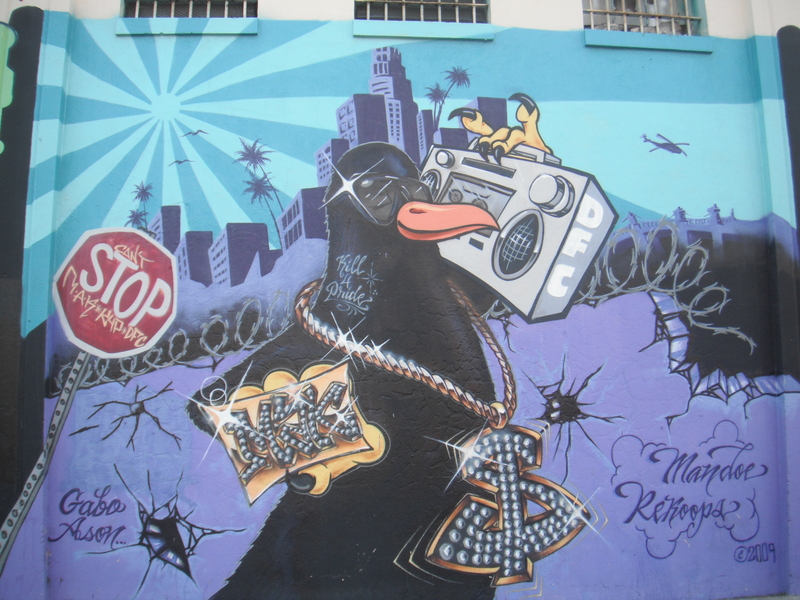 “Characters” are pretty much what they sound like – characters either adapted from pop culture or created by the graffiti artist, like this interesting creature. This one was signed with the name Gabo Ason and, on the right, Mandoe Rekoops. I couldn’t find any information on the names, but if you look at the giant pigeon’s neck, you can see the words ‘Kill 4 Pride,” which is K4P. The pigeon is also holding another tag in his hand, which looks like MAK. DFC is also sprayed on the side of the boom box he’s carrying. It’s like putting puzzle pieces together! This is definitely the most blinged-out bird Ive ever seen. I like the color of the background and the shades of blue used in the background to represent the rays of sunlights – it’s more interesting than the usual yellow. When I kept walking down the length of the wall (which was pretty much one whole side of the building), I saw a lot of different aesthetic styles and characters, some scarier than others. Scary as it is, the detail is awesome – from the little white swirls on the dog’s chain to the black background that extends onto the wall at the top. A lot of the pieces did that, taking the background color and making the piece less square by creating a sort of border that reaches up to the windows at the top. I found plenty of pieces so I’ll have to break this up into two posts! Tune in soon for the second part. I was beyond excited to stumble upon these pieces so unexpectedly. Sometimes life is fun that way.